Who has a favorite canine or canines they’d like to treat with some organic dog treats? Have you heard of Be Pawsitive? They have a fabulous monthly subscription where you can get top quality treats for your dogs. They are a wonderful company as they also give back by helping out dogs in shelters and rescue organizations gotta love that! We have joined up with Acadiana’s Thrifty Mom and a few other AMAZING bloggers to bring you this Amazing Be Pawsitive giveaway. “Delicious Organic Dog Treats That Also Give Back To Help Dogs In Shelters & Rescues.”. You can read Acadiana’s Thrifty Mom’s full review HERE! 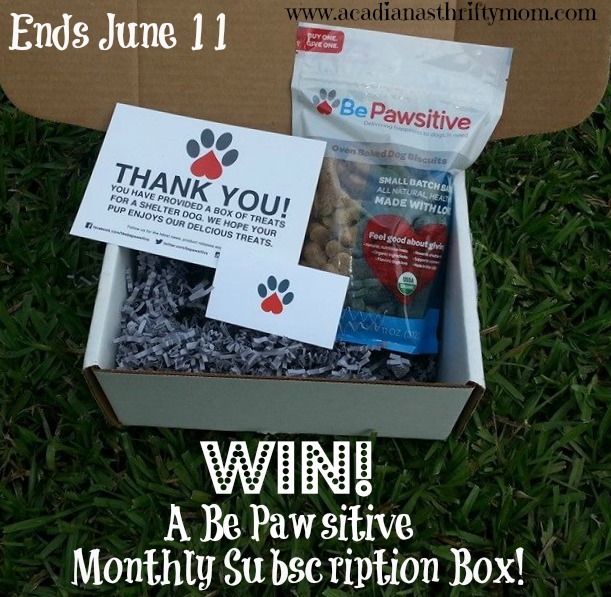 One lucky reader will win 1 monthly subscription box from Be Pawsitive. Simply enter the Rafflecopter below for your chance to win. i have a rat terrier-lucy & chihuaua named ricky ! I have three dogs. A chow/dalmation mix, a rat terrier, and a beagle/german shepherd mix. I have two mini dachshunds: Jager and Strudel! I have a black lab and a beagle. I have one beagle, two pomeranians, one chihuahua and a guinea pig. I have a little white cockapoo and my son has a snake. I have 2 black lab dogs. Currently we don’t have any so this would be an awesome treat for another family (we would gift it). Thanks. I have three pets. One golden retriever dog, Gavan. One siamese mix, Mya. One red ear slider turtle, Jessie. i have 2 sweet black labs who are sisters. I am godmother to two sweet dogs! I would love to win this for them! We have a cat named Lucy and dog named Pluto. My doggie is a german shephard mix. And I have two kitties also. Right now I have a little small mini poodle! I have had cats and dogs my entire life, but right now I have 2 cats and 1 dog! We Have 2 Dogs. (Pug) &(Yorkie) .. Also a Red Lored Parrot. We have 4 wonderful cats 2 – 17 years old and 3 rescue shelter mix dogs love them all! I have a cat but I would give this to my brother who has two dogs. We have a rescued American Bulldog and an Australian Shepherd! I have 7 dogs, a cat, chinchillas, and fish. I have a 3-year-old Husky mix named Waffles….she’s my sweet fur baby. I currently live with my mom & she has a 7 y/o beagle Sidney & I have an almost 13 y/o cat named Jasmine..thanks. I have a Yorkie-Poo named Lexie. I have a rat terrier named Dora and a cat named Camo. They are my pets and I adore them both to pieces. I have two beautiful (and spoiled) standard poodles. Two dogs – Precious and Stanley! We have two amazing dogs named Delilah and Lucky. I have 2 dogs — both chihuahuas! We have an 8 year old Australian Shepherd named Bear and a 8 month old Chihuahua named Peanut. We don’t have any anymore. I’m trying to win for my family’s pets. I share my home with 2 dogs and 3 cats. We also have a couple of horses. I have 4 dogs: 2 chihuahuas, 1 chorkie and a puggle. I also have 2 Bombay kittens. I have an English Mastiff dog named Xander! I have one dog, named Nancy.. she’s a 2 year old chug. I have three cats, one dog and one bunny. We have two sweet girl puppies we adopted 9 months ago i could not imagine live without them they are sweeties. My puppy dogs are a treat 1 beagle,,,,2 labs !!!!!!!!!!!! I have yorkies who love to try new treats. I have two large, long-haired, mixed breed rescue dogs. Kouga and Artie add so much love and joy to our home. We have a Sheltie puppy, two rabbits and an axolotl. i have a poddle with some snayser mix!! I have one furdoggie named Lady Girl. She rescued me about a year ago. She is mostly border collie with a little bit of black lab in her. She is my constant shadow. I have two dogs – Hazel, a 14-month-old Lab/Shepherd mix, and Summer, a 5.5-month old Mastiff mix. We have two dogs. A black lab/chow mix named Katie, and a beagle/corgie/border collie mix named Kiff. I have 4 dogs. 2 shiba inus- one of which was going to a shelter. An Italian greyhound that I was initially fostering but acquired and an am staff mix that I got at the shelter. Love them!!! I have 3 wonderful dogs. I have four cats and a one year old dog!